Thanks to John Constantine's magic and a cunning attack by Batman, Superman now lies in a deep, enchanted sleep. But what does the most powerful man in the world dream of in a slumber so strong even The Spectre cannot break it? The same thing Superman always dreamed of... a better world. There is little I can say about Injustice: Year 3 #13 that is not hinted at by its title - For The Man Who's Lost Everything. 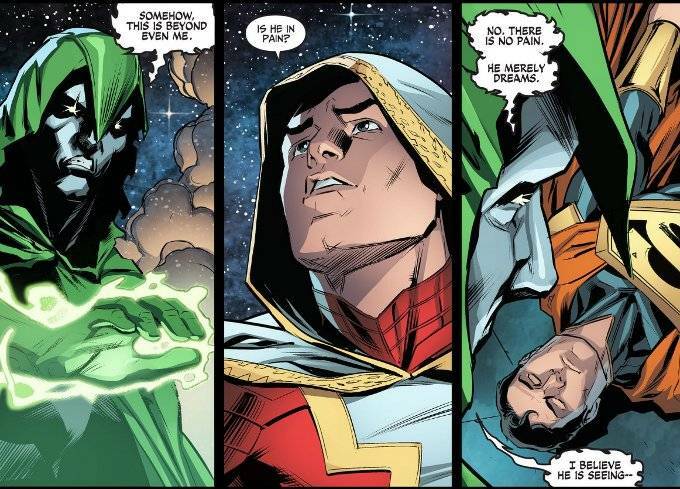 With a story centering around Superman trapped in a dream, comparisons to the classic Alan Moore story For The Man Who Has Everything are inevitable. One wonders though - especially after the powerful ending of this issue - is Superman the titular man? Or is it someone else? The artwork by Bruno Redondo, Juan Albarran, Xermanico & Rex Lokus does a fine job of conveying the story. More, it is filled with lots of novel little touches. I particularly like Harley Quin biting her lip as she realizes just how screwed she and The Joker are on a scale of 1 to 10.